B. Thomas (Arlington, Texas, United States) on 26 March 2014 in Miscellaneous and Portfolio. When they are gone, they are able to be with us in memories and hearts. Beautiful atmosphere. A sad sense of drifting peace to this . . fascinating moment to catch. Brilliant and powerful shot - bravo! Lovely luminous light and gentle image. 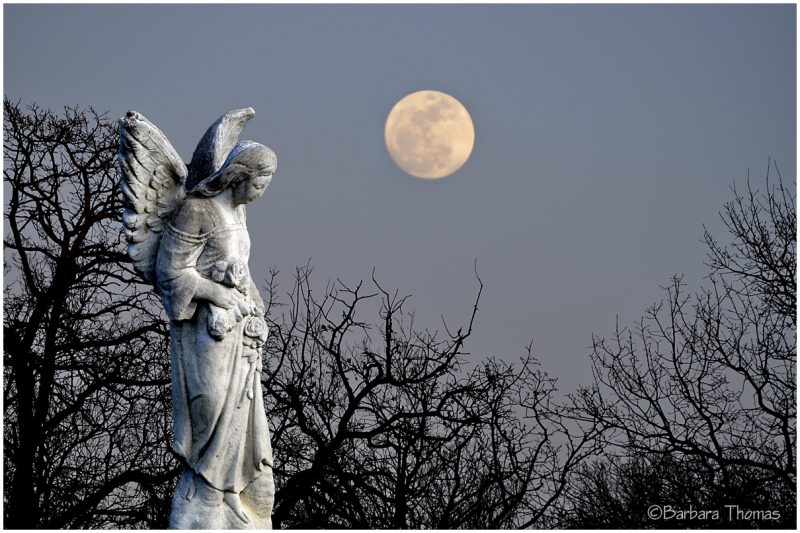 A fine use of this statue as a leading factor to the fine moon shot. Very well done. This is a terrific image! Very well done. Excellent shot. Love the reminder of Angels among us! A serene image - very calming! wonderful light on the statue ! The placement of elements in your composition is compelling. Stunning image and well deserved spotlight, can easily see why. . . and you quietly collect a Spotlight, too ! This is so good to see. magnifiquement poétique ! félicitations pour ce spotlight ! YES!!! good choice ... congratulations !!! :) Congratulations on the Spotlight ! Gorgeous image! Beautifully composed. The moon is just beautiful! A beautiful quote. Congratulations on the Spotlight. Very well deserved! I'm behind ... just saw this from yesterday. Congratulations on the Spotlight! Wonderful composition.... Congratulations on Spotlight . Awesome. Congrats on the spotlight. One the best compositions! Nice work!